11 Commonwealth is located on the north side of Commonwealth, between Arlington and Berkeley, with 9 Commonwealth to the east and 13 Commonwealth to the west. 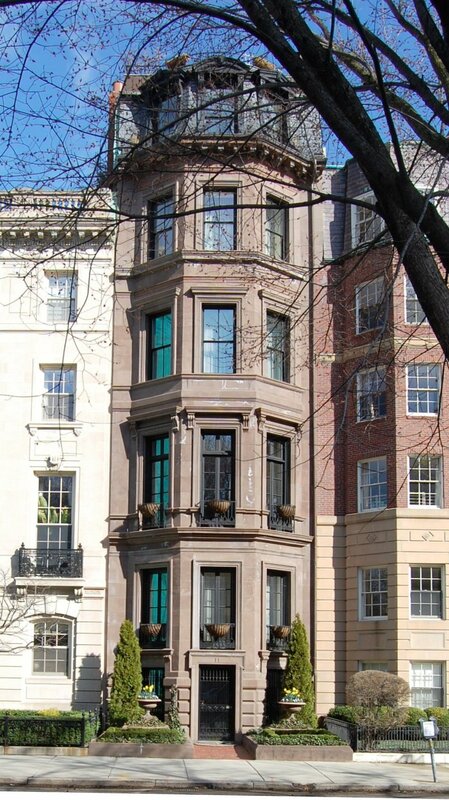 11 Commonwealth was designed by architect Nathaniel J. Bradlee and built ca. 1868, one of two contiguous houses (11-13 Commonwealth) built for merchant Frederick Hall Bradlee. Although they shared the same surname, it does not appear that Nathaniel Bradlee and Frederick Bradlee were closely related. Frederick Bradlee purchased the land on which 11-13 Commonwealth were built on July 2, 1860, from shipping merchant and US Congressman Samuel Hooper. It was part of a larger tract of land Samuel Hooper had purchased from the Commonwealth of Massachusetts on May 2, 1860. The tract extended west from the lot where 11 Commonwealth would be built to the corner of Commonwealth and Berkeley. Samuel Hooper and his wife, Anne (Sturgis) Hooper, built their home on the corner lot, at 27 Commonwealth. Click here for an index to the deeds for 11 Commonwealth. 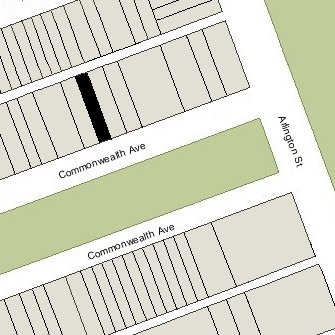 The house to the east of 11 Commonwealth, at 9 Commonwealth, had been built ca. 1861 for Richard Greenleaf, and when it was built, the western party wall was located entirely on Richard Greenleaf’s land (rather than half on his property and half on the lot to the west, which was the usual practice). 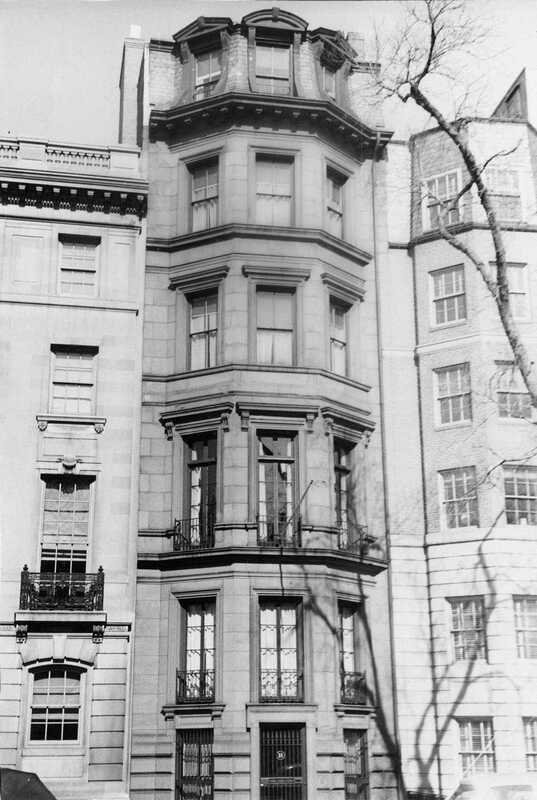 On December 4, 1867, as Frederick Bradlee was preparing to have a house built at 11 Commonwealth, Richard Greenleaf sold him a strip of land six inches wide and 103.5 feet long, “commencing at a point one foot back from the face line of my building and extending to the rear passageway,” so that Frederick Bradlee would own one half of the party wall between 9 and 11 Commonwealth. Frederick Bradlee had 11 Commonwealth built on a lot with a 21 foot frontage, and 13 Commonwealth built on a lot with a 29 foot frontage. To compensate for difference in lot sizes, 11 Commonwealth was five stories (plus basement) whereas 13 Commonwealth was four stories (plus basement). When the houses were completed, he and his wife, Lucretia (Wainwright) Bradlee made 13 Commonwealth their home. On September 1, 1868, Frederick Bradlee sold 11 Commonwealth to his daughter, Elizabeth Gair (Bradlee) Abbot, the wife of dry goods commission merchant Henry Ward Abbot. They made it their home. They previously had lived at 8 Louisburg Square. Henry Abbot died in October of 1880. 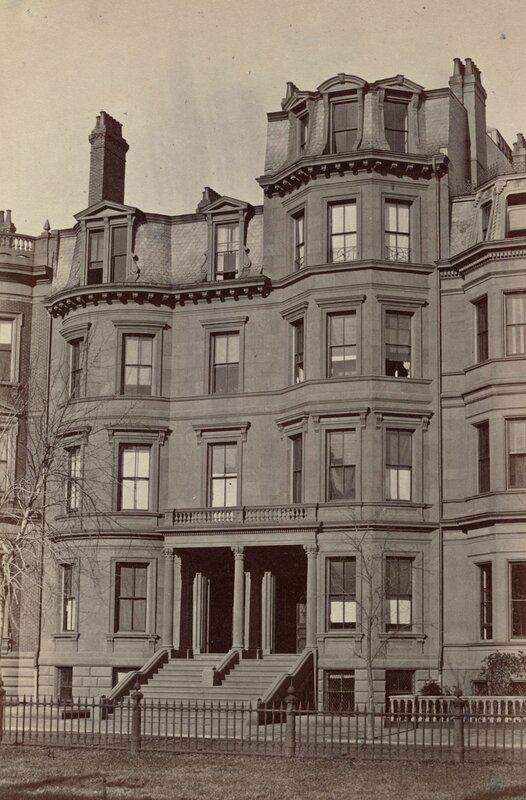 Elizabeth Abbot continued to live at 11 Commonwealth with their children: Elizabeth Bradlee Abbot, Lucretia (Lula) Wainwright Abbot, Frederic Bradlee Abbot, and Henry Ward Abbot. Elizabeth Bradlee Abbot married in June of 1881 to Frederic Jessup Stimson, an attorney, and they moved to Dedham. Frederic Bradlee Abbot moved to Worcester in about 1885. Lucretia (Lula) Wainwright Abbot married in December of 1894 to Jean Mure, an instructor of French at Harvard; after their marriage, they lived at the Hotel Brunswick (southeast corner of Clarendon and Boylston). Henry Ward Abbot married in May of 1898 to Isobel Anderson; after their marriage they lived at 11 Commonwealth with his mother. Henry Abbot was an artist and noted ornithologist. Elizabeth Abbot died in December of 1902, and Henry and Isobel Abbot moved soon thereafter, possibly to Yarmouth where they were living at the time of the 1910 US Census. 11 Commonwealth was not listed in the 1904 Blue Book. On May 2, 1904, 11 Commonwealth was purchased from the estate of Elizabeth Abbot by Mary Ellen (Ruby) Morrison, the wife of architect William Langley Morrison. In 1904, they had lived at 83 Beacon. As originally designed, 11 Commonwealth and 13 Commonwealth shared a front portico and stairs. In February of 1907, 13 Commonwealth was acquired by George Nowell and Anna Lee (Ames) Nowell, who planned to replace the house with a new building. On July 6, 1907, the Morrisons entered into an agreement with Anna Nowell to permit removal of the portico and stairs at 13 Commonwealth. The entrance to 11 Commonwealth was relocated ro the center of the bay and lowered to street level. The Morrisons continued to live at 11 Commonwealth in 1909, but by 1910 had moved to 127 Revere, and by 1913, they had purchased and moved to 279 Dartmouth, where they were living at the time of his death in April of 1915. By the 1909-1910 winter season, it was the home of wool merchant Jacob Frederick Brown and his wife, Mariette Starr (Seeley) Brown. They previously had lived in an apartment at 330 Dartmouth. The Browns first leased 11 Commonwealth from Mary Morrison, but on June 9, 1919, Jacob Brown purchased the house from her. That same month, he applied for (and subsequently received) permission to construct a three-story rear addition to provide for a conservatory, pantry, and bathroom. The addition was designed by architect Edwin Sherrill Dodge. The Browns continued to live at 11 Commonwealth until about 1926, when they moved to an apartment at 65 Commonwealth, which had recently been completed. They continued to be listed at 11 Commonwealth in the 1927 and 1928 Blue Books, but the house was not included in the 1927-1930 Lists of Residents and was not listed in the 1929-1930 Blue Books. On April 18, 1930, 11 Commonwealth was acquired from Jacob Brown by publisher Charles Edward Bacon. He and his wife, Pauline (Conant) Bacon, made it their Boston home. They previously had lived at the Hotel Somerset. They also maintained a home in Manchester-by-the-Sea. In May of 1937, they applied for (and subsequently received) permission to construct a two-room 12 foot by 22 foot rear addition on the second and third floors. This addition also was designed by Edwin Sherrill Dodge. On June 25, 1951, Charles Bacon transferred the property into both his and his wife’s names. Charles Bacon died in March of 1958. Pauline Bacon continued to live at 11 Commonwealth. In July of 1959, she applied for (and subsequently received) permission to add a kitchen and bathroom on the sixth floor, converting the house from a single-family to a two-family dwelling. She continued to live at 11 Commonwealth until about 1963. On September 6, 1963, 11 Commonwealth was acquired from Pauline Bacon by Elizabeth (Kayhart) Dare Pendleton Heller, the wife of Louis E. Heller. They previously had lived at 165 Mt. Vernon, and before that at 33 Marlborough. Louis Heller was a real estate dealer; Elizabeth Heller was a former actress. In July of 1964, the Hellers applied for permission to convert the property into a three-family dwelling. The subsequently abandoned the application. On October 25, 1985, 11 Commonwealth was purchased from Elizabeth Heller by Richard K. Bendetson. On January 12, 1989, it was acquired from Richard K. Bendetson by Gerald S. Fineberg, and on November 27, 1989, it was purchased from him by Rev. Barbara H. Nielsen, an Episcopal clergywoman and counseling psychologist. 11 Commonwealth remained a two-family dwelling, assessed as a single-family dwelling, in 2015.